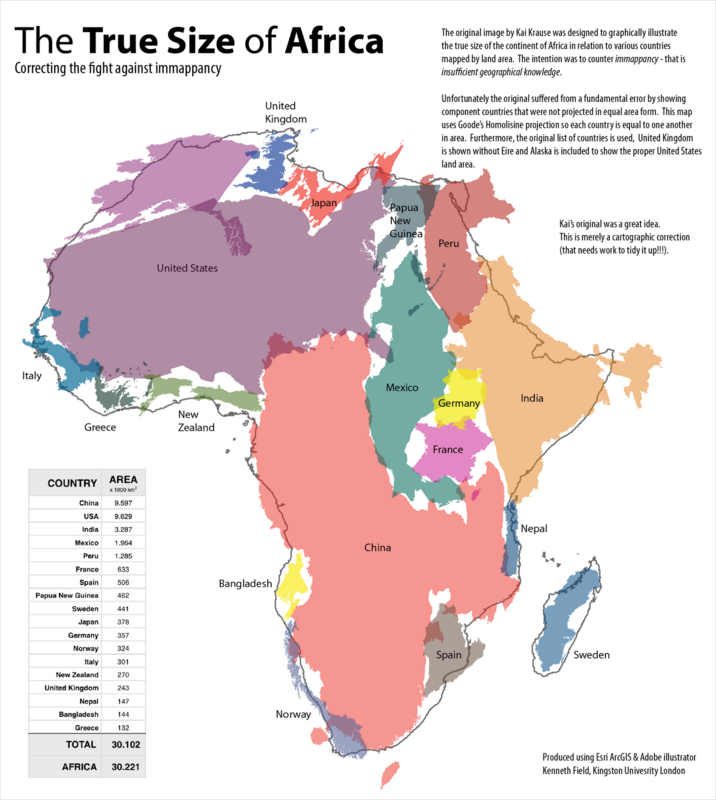 About a year ago a map by Kai Krausse grabbed attention for displaying the true size of Africa in an eye catching way to illustrate comparative geographies. 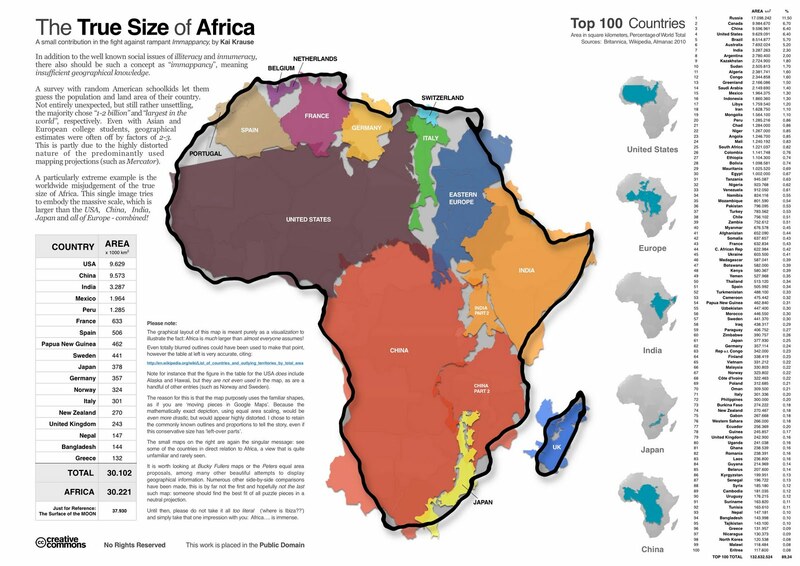 At first glance it shows how large Africa actually is in comparison to other familiar shapes such as the outline of the United States of America. On closer inspection there are some aspects of Krausse's info-graphic that undermine its attempt to portray the relationship between the land area of various countries. The Republic of Ireland is included in the United Kingdom map; an odd collection of countries are labeled Eastern Europe; China and India are bizarrely carved up for artistic purposes (to make them fit); and Alaska is omitted altogether which reduces the land area of the United States considerably. Krause's work also includes a different set of countries to those presented in the accompanying table. Indeed, the table identifies a set of countries that, combined have a land area equivalent to Africa to show the basis for comparison so it’s confusing as to why the map doesn’t portray the same countries. Approximately 45% of Africa is comprised of the uninhabitable Sahara Desert which also renders the comparison a little misleading and certainly points to a further issue: that land area isn't the best metric for comparison anyway because we might be more concerned as a society with what constitutes habitable areas. Africa is certainly bigger than the combination of the countries Krause uses but it is a continent of over 50 countries and has a smaller overall population than either India or China. 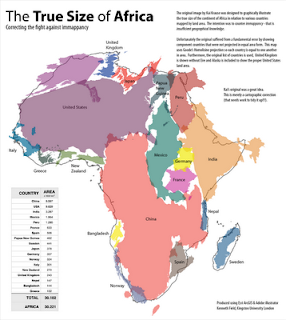 It's so much smaller that you can add the population of the world's third most populous country (USA) to Africa to approach the population total of China. I've left the most fundamental error to last though... the map shapes Krause uses are not equal area. They are, in fact Web (or spherical) Mercator. As a response to various blog posts, Krause updated his map to a second version that stated that he felt using equal area based country outlines would be highly distorted and reduce the map’s message. This is simply not the case and is an astonishing cartographic error for a map that is based entirely on the principle of illustrating relative areas. Whilst one can accept an element of artistic license in such work, the fact that the explicitly stated rationale for the work is to address what Krause describes as immappancy leads the work to seriously fail. Immappancy, he describes, refers to insufficient geographical knowledge and his map is an attempt to bring attention to the poor levels of geographical knowledge displayed by many people. He cites the fact that a survey of American schoolchildren revealed the majority chose "1-2 billion" as the US population total and "largest in the world" as the US land area and with Asian and European college students geographical estimates of land area were often out by a factor of 2 or 3. I don’t take issue with the idea of exposing the problem of spatial illiteracy, or immappancy as Krause has defined it, but he is profoundly guilty of similar levels of immappancy by creating a completely inaccurate depiction. He is demonstrating his own immappancy. The version I re-created projected the countries using Goode's Homolosine equal area projection and which included the countries as they appeared in the table. I was accused of being a marauding carto-nerd for pointing out the errors and, worse, going out of my way to provide a corrected version. It baffled me why so many people without any background in cartography were so unwilling to be corrected by someone who knew what was wrong. Are we so caught up in our own self-importance that we lose perspective and, worse, are unable to accept criticism or comment? I guess no-one likes to be told they are wrong but this world is full of immappancy so if I have to maraud a little to bring attention to cartographic failings then so be it….and thus my blog was born. It’ll feature an eclectic array of the weird and wonderful, the useful, the not-so-useful, the insightful and possibly the odd rant or two. It won’t be a regular blog…just when the whim takes me.